Digital South Australian drivers’ licences will be available on a State Government smartphone app by the end of the year, InDaily can reveal. A range of SA licences can now be added to your smartphone with drivers' licences to follow soon. 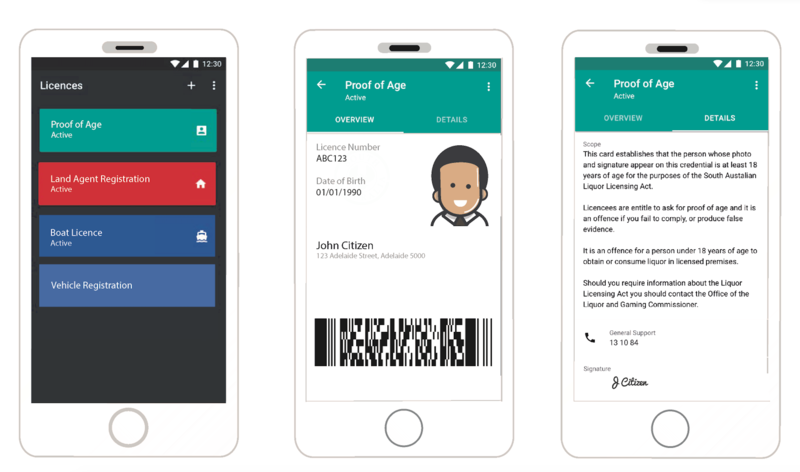 The Government told InDaily today that upgrades to the mySA GOV smartphone application now allow proof-of-age cardholders, boat licence holders, land agents and land sales representatives to add a digital version of their credentials to their smartphone. Driver’s licences and occupational licences are scheduled for addition to the app in the second half of this year. However, don’t anticipate a lot more wallet room yet – the Government says physical licences will still be required, for a while at least. With security a major concern, the Government app features a unique barcode that refreshes every 30 seconds. The feature is intended to prevent the use of fake digital licences. Users will need to sign up for a mySA GOV account, and verify their identity, in order to use a digital licence. Premier Jay Weatherill said the app would improve convenience and security for licence holders. “This new app gives people convenient access to their pass and licence information as well as peace of mind that their credentials cannot be stolen or used fraudulently,” he said. But it isn’t the end of the physical driver’s licence – or not yet, anyway. The Government expects to be issuing physical licences of every type “for the foreseeable future”. Users of the app are cautioned to still carry their physical credentials, because not all businesses will yet be set up to validate digital licences. When pressed by InDaily about the point of the smartphone option, given the continuation of physical versions, a Government spokesperson said the app provided the convenience of renewal reminders and having an ID “one tap away”. Staff at licensed venues, who need to check ID, can install the mySA Gov app on a smartphone or tablet which will then give them an option to scan the barcode of a patron’s online credentials. A real-time check of the licence or ID pass will then follow. A government-supplied image of how the app looks. If the venue doesn’t have the app, the staff member can view the digital credentials as they would physical ones. “A ‘shake-to-animate’ feature has been added to the app, which will animate the screen and display a ‘tick’ when the phone is shaken to show that it is not a screenshot,” a government spokesperson said. NSW has already introduced digital licences for some categories, with drivers’ licences set to go digital in 2018. The Government wouldn’t reveal the cost of the app’s development, saying it was “commercial in confidence”.